It would be an understatement to say that Judd Blau is just an involved community member. Rather, he is immersed in his community and making positive change where he can. Judd has worked at TDS for 12 years and leverages many of the skills he uses at TDS to make a difference in, DeForest, Wis., his hometown. His desire to give back to his town and his commitment to expanding DeForest are just a few of the reasons he was recognized as “Most Influential” by Madison’s In Business magazine. 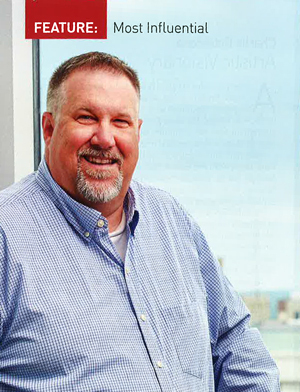 Judd, along with 14 other Madison area individuals were highlighted in the July issue as influencers in business, government and non-profit in the Greater Madison area. Judd has been volunteering in the Village of DeForest for a long time, starting with coaching youth sports, which he continues today. He later became politically involved when he ran for Village Trustee, a position he held for two terms. After displaying hard work and excitement for DeForest, Judd was encouraged to run for Village President. He did just that — and won! He’s now beginning his fourth term as the Village President. “I didn’t have an agenda when I ran, but I knew I wanted to give back and I thought that I might be able to help,” Judd said. Since being elected, Judd has spent the past four years helping to initiate many improvements within the village. He recognizes his incredible staff at Village Hall for all of their help making those improvements possible. Focused on growing DeForest, Judd led efforts to change zoning and regulations that would make the Village more desirable to new businesses. He believed DeForest could grow and foster positive improvements, but first, the village needed a change of mindset, one aimed at promoting the village. “By removing some of the unnecessary barriers and promoting the village, we were in a position to bring new businesses to DeForest,” Judd explained. His vision was right on, DeForest has expanded and welcomed seven new businesses in the past four years. Judd is also interested in music. He says he was born into it since his father has always been into music and played in his first band at age five. Judd taught himself how to play guitar 12 years ago because he subconsciously needed a new creative outlet. Then he played in a classic country band for a few years but now leaves his guitar playing for church and home. Whether it is as Village President, a youth football coach or a manager at TDS, Judd aims to help where he can and is enthusiastic with his involvement. It’s why he was named an influencer in the Greater Madison Area. Congrats Judd!